For me & sis, it would be a drive but a very long drive from So Cal, about 4 hours. PP is advertising that the lanyard traders won't ever be sold, but who knows. They said they wouldn't sell the Platinum pins outside of Shanghai, but I think they had some on hand at the other pin events (not sure). I do know that it doesn't appear worth it to get the table at $100 so if we do go, we will just be driving in Saturday, wandering around with our books and bags and hopefully finding people outside of So Cal to trade with. DeputyDonald and TheMickeyMouseRules like this. I bought a platinum LE 100 pin on their web page... another example of the ever changing claims... although in this case a happy one for me, since I like the pin. So, now we are looking at hotels. We aren't staying at Circus Circus - a lot of bad reviews about the quality of the rooms - so now it's like, which one to go to?? I also looked at alternative hotels... there is a Springhill Suites about 7 blocks away. Haven't gotten any farther than considering the SHS. Get the app Hotel Tonight, great deals on rooms and they have reviews and such. I have never been to one of these events. But just wanted to chime in on a few things, as a Vegas resident. I would definitely advise against staying at the Circus Circus. There are so many hotels in Vegas, and getting to the strip is easy. I wouldn't worry about being super close unless you are planning to walk. If you have a car, you can go outside the main "strip" area and find better options that are cheap. I would go for a chain you trust and pick a further away location and just drive in. We do have a decent amount of traders here in Las Vegas, and I believe a lot of our group members are attending. So hopefully you can find some "non-socal" traders to trade with. I am super bummed that I will be out of town, but excited to have something like this happening locally here. Hopefully we'll get more events in the future! starry_solo, watzshakinbacon and TheMickeyMouseRules like this. I now have a conflict for this weekend event, so will be unable to attend. I am planning to attend their Orlando event. So would love to work with others to trade for the lanyard Le 200 pins. I am going to start a trading thread for these pins. Hopefully this will allow us to get the ones we want. I will be looking for maleficent, Cheshire and stitch. Sis & I are still planning to go. I spoke to Lenny (owner of PinPics) today and he said they will have enough lanyard traders for purchase for 50-60 people to purchase a 25-pin lot. These will be about $9.50 each. If you buy 10-pins, it'll be about $10.50 each and they take cash or credit cards (or PayPal). When those are traded for the lanyard pins, they will be recirculated and re-sold so that they should not be running out of lanyard traders. In addition to that, I just heard from Pinnopolis that the lanyard pins can be traded for any Pinnopolis pins. I'll probably be trading the ones that they give extra for late preorders at the Orlando event. Hmm.. maybe someone will be interested in splitting with me if I go? Yup! I only have the ones I bought to keep. And I should say each pin will come out to $9.50-10.50, so he prepared to spend $105-238 for the 10 or 25 pin lot. I'll be getting the 25 pin lot so sis and i can both do lanyard trading. You are referring to the extra pin pinopolis promised to send because of the delays with their pre-orders? I have not received a single extra pin, but I have received several late pre-ordered pin shipment from them. Have you received multiple free pins already? From my talk with Lenny, I also learned that the reason the Platinum pins are being sold on the site is that the Shanghai store went out of business and their inventory purchased back by HotArt (?). Okay, here I am with pictures of the Pinopolis lanyard pins that were displayed at the DPT event. Thank you @bookhugger for putting up with my FB messages with these pictures as I find it is easier for me to copy & paste from a message than it is to download the picture to my computer, upload it to imgur, then copy & paste. OK, so I also found out that while the pins will be displayed on the lanyard, the one you will be getting will come out of their half-apron (with pockets). It will be in a plastic bag so that it will go a lot quicker when trading - one pocket will have the lanyard pins, the other pocket will be empty to put your pins that you will trade with them. I posted the below in the Trading: - Hotart Lanyard Trading LE 200 Pins thread but reposting here as well. I'm hoping those of you who go to the event will be able to provide some insight on the below (as I consider what I am going to do in Orlando). 1. Although the above picture (and other pictures of the lanyard shown so far) show lots of the pins on the lanyard, they said that there will be 5 of these pins per lanyard. I am thinking they will have more than 5 total pins on a lanyard, So will they have multiples of each pin on the lanyard to fill it up? Or will they also have a mix of non-LE pins and you have to pick the right ones? Or should I ignore the narrative and the picture is how they will really be? 2. They also seem to indicate that each of the five colored lanyards will have different pins, at least in their words. Which makes sense since they were showing a total of 25 "reveal" pins to start with (although there is the other photo showing 35). But again, the photo of the lanyards they have in their announcement shows the exact same pins on all colors of lanyards. 3. They also indicate you can trade for a total of 10 pins - 2 pins per lanyard, 5 colors of lanyards. But how will they control that? It's a free event so even if they are giving out color-coded tickets at the door, what stops someone from using their tickets, leaving, and coming back in a few minutes later to get another set of tickets? They going to be checking IDs and tracking names, etc? Or are they only going to have one person with each colored lanyard and just expect that person to recognize faces and make sure nobody goes back for seconds? 4. What's the point of paying extra for early entry? The only difference is 1 more hour of activity. But presuming they are going to have the lanyards available the whole time (which I would think they must), and since you are limited to a grand total of 10, and they are going to flip them as needed, seems the only thing extra you get for your money is an hour more of trading time with other participants. Any maybe a pin that is on the initial lanyards if it is very popular and all 200 get picked up in the first hour. I fixed the formatting issue (everything is centered on their FAQ - please get a new webmaster! lol) and also highlighted the questions. Q: Where can I find Pinopolis numbered pins to trade? A: Pins are available at our online store Pinopolispingame.com, as well as through your local pinmaster here and at any HotArt special appearances or events worldwide. Q: How much will the Pinopolis numbered pins cost? A: Pins are available here starting as low as $12. 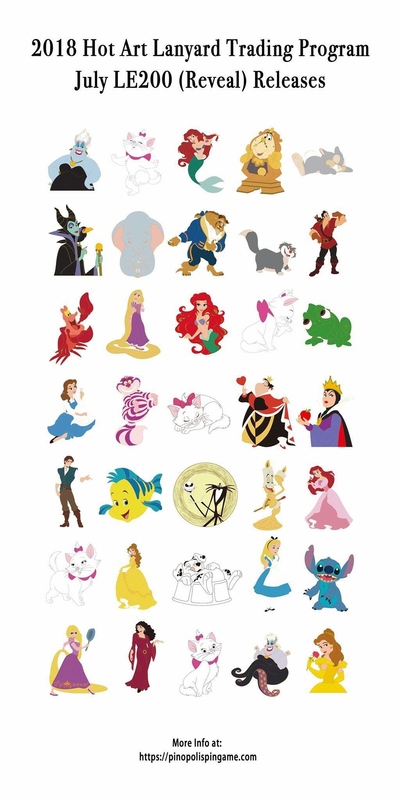 There are bundled sets of 25 that will cost less than $10 a pin coming soon! Q: Can the new HotArt Trading pins be used to trade with the pinmasters or play Pinopolis? A: No. They will not have Pinopolis trading game numbers on the back. Q: Can I use Pinopolis Bao Bay Pins to trade for a Lanyard Pin? A: Yes! In fact they are currently the best value to trade with. Q: Is there a limit to how many I can trade for? A: Every Pin master has five different color lanyards that they will have available throughout the day and will switch at various times. You can trade up to 2 pins per color lanyard, per set, released each day. Q: How many pins are in a set? A: A set usually consists of five pins. A: Yes, 4 and up. A parent or legal guardian must be present for any trader between 4-14, at the pin masters discretion. Q: So when a set of pins are all traded for, a new set will be available? A: Yes, there will be a continuous supply of these distinctive low edition traders. Q: Can I come every day to trade? A: Yes. This will give you the unique opportunity to acquire low edition size valuable pins avoiding the high priced secondary market. Q: What if I don’t have a pin master near me? A: Contact us at info@pinopolispingame.com to inquire about a pin master program for your area. Write Pin Master in the subject. Hello. These pins will be a continuous series offered at event. We will have 25 at this first event in Vegas. I will be posting more info in the next week.